Four members of the Seattle Jazz Hall of Fame can be seen in one place every week of the year – the New Orleans Creole Restaurant. During a recent week, seven Hall of Fame inductees were spotted there. This heart of Seattle jazz beats where the city was born, the historic Pioneer Square district. Jimmy Allen and Gaye Anderson opened the New Orleans Creole Restaurant in 1985. The Bob Jackson Trio played jazz on Monday nights. For the first two years the restaurant was in the Pioneer Hotel building at 81 Yesler Way. The street got its name from the original location of Henry Yesler’s steam sawmill in 1853. Wooden buildings sprouted up and down the waterfront to serve the logging trade – cheap hotels for the transient labor, stores for supplies, and clubs for entertainment. In 1987, Jimmy and Gaye moved their operation around the corner and across the street to the club’s current address, 114 First Avenue South in the State Hotel building. The State Hotel was among the first structures rebuilt after the big fire of 1889. More than twenty five blocks between Jackson and Union streets burned to the ground in the blaze prompting the city to establish a Fire Department. New building codes emphasized slowing the spread of flames through the use of stone, brick, iron, and large timber beams. Those 19th century design rules can still be seen today in Pioneer Square facades. Tall arches of stone and brick frame expansive windows, flooding interiors with natural light. The load of upper floors is born by brick walls that run from the street to the alley. Sixteen inch thick interior dividing walls running parallel from street to alley were required to be no more than twenty seven feet apart. Limited numbers of archways in these walls were allowed to reduce framing and limit fire movement. The resulting rooms are tall, narrow, and long – an odd shape for live music. The New Orleans puts the large walls to work as a gallery for hundreds of jazz musician portraits and posters. A rectangular stage rises against the left wall opposite the archway into the bar. Just beyond the archway to the kitchen, a small balcony fits under the tall ceilings. Small square tables line the walls and are easily reconfigured to accommodate parties that tend to grow as the evening develops. Wood wainscoting and sconces on the walls remain from the booths of this building’s earlier establishments. The first occupant was the Whiton Hardware Store in 1891 followed by the Olympia Café run by Japanese proprietors in the 1920’s and 1930’s. A similarly titled Olympic Café made a home there in the early 1970’s, followed by the Old Town Café later in the decade. Michael J’s opened in the early 1980’s, then Luigi McNasty’s and Pinocchio’s before the New Orleans took over. The wood floor is dark from decades of traffic. The Kelly green ceiling is crisscrossed with metal electrical conduits from power added in a series of renovations. Eight metal candlestick chandeliers hang with at least one dark light bulb on each awaiting replacement. Underneath a vintage sign advertising rooms for seventy five cents, a lunch patron sits by a window table in the bar, enjoying a rare afternoon sun break. A side of red beans and rice with a corn fritter makes a filling snack at a recession friendly price. In the center of the table cluster bottles of hot sauces – Cajun Power Garlic Sauce, two flavors of McIlhenny Co. Tabasco and packets of Dixie Crystals Pure Sugar (since 1917 from Savannah, Georgia). The spirit of Seattle jazz legend Floyd Standifer, who played at the New Orleans for twenty years before passing in 2007, watches over the scene. A string of songs featuring his gentlemanly voice, trumpet, flugelhorn, and tenor saxophone floats through the air. Basketball finals run silently on the bar television while neon glows a mixed case of beer brands. Later, as sunlight fades, the restaurant’s unique shape, antique building materials, and crepuscular light evoke a feeling from an earlier age. The mood deepens as musicians take the stage. The smell of cooking onions, peppers, and tomatoes, the Creole Holy Trinity, wafts from the kitchen. Time stops. There is only now. In the front window on Monday a sign reads, “No Cover Tonight.” Another says, “All Ages Welcome Until 10 PM.” At 6:30, cornetist Dave Holo sits on stage and glances around at the rest of the band. His toe presses down and his heel rises off the floor. Then his heel stomps down. Whomp…, whomp…, whomp, whomp, whomp. They launch into Earl Hines’ “You Can Depend On Me.” The sound bubbles and joyfully leaps into the air. Geoff Cooke’s thumping bass pushes the band along on his top two gut strings. Jake Powel strums backbeats on banjo. Andy Carr rolls along on piano while George Goldsbury weaves clarinet arpeggios around Dave’s melody. Gaye bobs from table to table greeting diners with a friendly “How are y’all?” and “Happy Monday!” Her silver-platinum blond hair streaks by with steaming plates of gumbo and jambalaya. How can such a small person carry so many plates? Dave introduces the band saying, “Tonight we will play music from the 20’s, 30’s, and even the 40’s.” He kicks into a bright tempo for the 1924 song “Nobody’s Sweetheart Now.” Next, Geoff croons “Route 66” while the crowd sings along. An older couple strolls to the center of the floor and dances for a few choruses. “Harvard Blues” brings a second couple to the dance floor and they slowly turn, foreheads kissing. George slides through a sweet soprano saxophone solo. Two young women in black lean together over their table. “This drink is bigger than the last place.” They don’t need to yell because the music is just a little louder than table conversation. A mother takes her toddler to the bandstand for a closer look. The music and dancing infect the audience with smiles. Hands and feet tap. A waitress cruises by a table. “You all done hun’?” She helps a needy patron to the bathroom. The band continues with “Strutin’ with some Barbeque,” “Honeysuckle Rose,” “Miss Clementine,” “The Steamboat Stomp,” “Chinatown”, and closes the first set with “Down in Honky Tonk Town.” The audience doubled in size while the band played. Two more sets to go. On Tuesday, Dave is back with a different group that he calls the Holotradband. Mike Daugherty plays a traditional “novelty” percussion setup with ricky-ticky rolls on the wood block, slap-stick syncopation on the cow bell, and a bouncy pulse every beat on the bass drum. Matt Weiner adds to the hot rhythms by slapping the strings on his upright bass. Lance Haslund strums guitar on each beat in the style of Freddie Green from Count Basie’s band. The front line is rounded out with Bruce Hall on clarinet and David Loomis on tailgate trombone. All the jumpy rhythm generated by the band on Hoagy Carmichael’s 1929 hit “Rockin’ Chair” gets two dancing couples gyrating with the Charleston and the Lindy Hop. After Carmichael’s “River Boat Shuffle” and Fats Waller’s “I Believe in Miracles” the dancers take a break at their table, fanning themselves with dinner menus. A table of French speaking youths asks where to find other good dancing spots. At 10:00 people are still coming into the club. Seattle Jazz Hall of Fame member Clarence Acox presides over the stage from his drum throne on Wednesday with the Legacy Quartet. Of the New Orleans, Clarence says, “It has been the cornerstone of all my musical playing in Seattle.” Clarence and the band recently celebrated their twenty fifth year of Wednesday nights at the New Orleans. Originally with Floyd Standifer, this mainstream jazz group now features a revolving roster of guest artists with Earshot’s Golden Ear winner for Northwest Jazz Instrumentalist of the Year, Bill Anschell on piano, and another Seattle Jazz Hall of Fame inductee, Phil Sparks, on bass. This Wednesday features Clark Gibson on alto saxophone. Clarence’s deep baritone announces the first tune will be “You and the Night and the Music.” Someone in the audience adds, “And my birthday.” After leading the audience in “Happy Birthday,” Clarence counts of the Broadway show tune, tucks his lips between his teeth, lays out a wide, comfortable groove on the ride cymbal, and cracks a few comments from the snare drum. This Thursday, Ham is away at a funeral so saxophonist Travis Raney fills the air with notes that sound like fat, fluffy pillows of fun. Bob Hammer is recovering from surgery so Bill Anschell substitutes to wrestle sweet chords from the old Mason and Hamlin piano. Andy Zadrozny covers with nimble fingered bass playing for an absent Mike Barnet. Drummer Patty Padden watches dancers’ feet to inspire her solos. On trombone, another Seattle Jazz Hall of Fame star, Ken Wiley. Most people know Ken from his twenty three years on KPLU’s Art of Jazz show now on Sundays from 3:00 to 6:00. A young couple displays their deft dancing skill while the band plays “Just You, Just Me,” “Stars Fell on Alabama,” and “Exactly Like You.” Her short racer back black dress and his untucked striped shirt magically hover above the dance floor while their legs dazzle and blur. Patty keeps an eye on their feet while she digs into the groove and uncorks a solo on her low, resonant tom-toms. A dog barks near the front door. During the slow song “Georgia,” the dancers retreat to guzzle ice water, smiling and panting. Friday is home for trumpeter Tom Marriott and Flexicon, winners of the Earshot Golden Ear award this year for the best Northwest Acoustic Jazz Ensemble. Former guitarist and saxophonist Rick Mandyck now plays piano in this contemporary jazz band with bassist Phil Sparks and drummer Matt Jorgensen. During the lyrical waltz “Trapeze” by Claudine Francois, Tom covers the microphone with his bell and plays quietly to emit a warm, diffuse tone. Rick leans forward and lifts his body off the piano bench on fast descending runs. Tom announces the Chick Corea tune “500 Miles High” and adds deadpan, “I swear I don’t know what this title means.” The rest of the set includes “Sweet Love of Mine,” “There is no Greater Love,” and “Milestones.” Some audience members stroll between the New Orleans and Café Paloma around the corner to hear pianist Wayne Horvitz. The restaurant nears its 200 person capacity on Saturday afternoon for a celebration of the life of trumpeter Ed Lee. A buffet and slide show at the back provide mourners with sustenance and memorable images. On stage, drummer Clarence Robinson steers a steadily changing line up through jams on blues and standards. 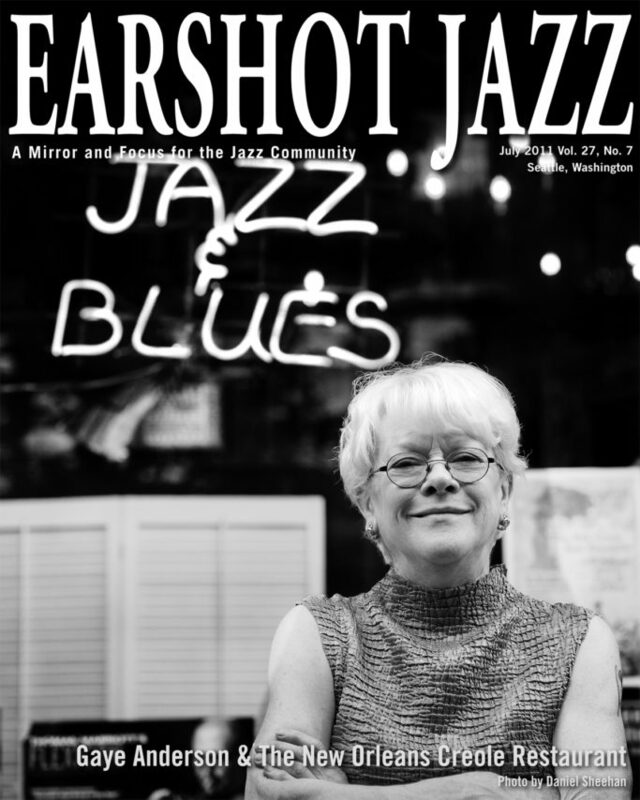 Three more of the Seattle Jazz Hall of Fame are in attendance – radio producer Jim Wilke, volunteer and aficionado Lola Pedrini, and multi-instrumentalist Jay Thomas. The Seattle jazz community has a home at the New Orleans Creole Restaurant. Built and cared for by Gaye Anderson, she has persevered in the face of losing her partner to cancer, financial insolvency, lapsed liquor licenses, economic recessions, and even earthquakes. 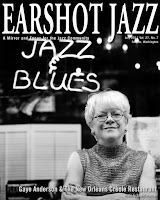 Come on in any night of the week to hear the history of our city’s jazz heritage being made. It sounds even better the more people show up and listen.